mylap peT bed Passes the smell test! MyLap Pet Bed is a one-of-a-kind bed that lets pet parents be there for their pets - even when they're away. MyLap Pet Bed is MADE IN THE USA. pet parents provide the bed’s cover using their own previously worn soft pants, which adds their scent to the bed. ​MyLap Pet Bed was created for dogs and cats that enjoy being close to their people, and for people who love their pets. Combining the senses of touch and smell makes this unique bed irresistible to your pet's nose and heart, which can help keep them calm and may decrease separation anxiety. ​Our cats and dogs are not just our pets; they are members of our family. They give us unconditional love, comfort, and affection, loyally greeting us at the door when we arrive home from a long, stressful day. Similarly, we are their world, so when we are gone, most pets will search for any spot that reminds them of us—a place that is not only comfortable, but that also carries the scent of us. This is why we often find our fur-babies laying on our clothes, our beds, our furniture—basically any place we have been! The familiar, comforting scent of pets’ owners has been shown in multiple studies to help reduce separation anxiety and create an overall sense of calm in cats and dogs. This is why we created the MYLAP Pet Bed. To learn more about the importance of our scent to our pets, check out our Additional Resources page. Are you going on vacation soon? Will someone be watching your pet? Do you have to take your pet to a kennel, doggy or kitty hotel; now they even have spas for pets! The MYLAP Pet Bed is the perfect campaign for them to take a little piece of you with them, or should I say, your scent with them. 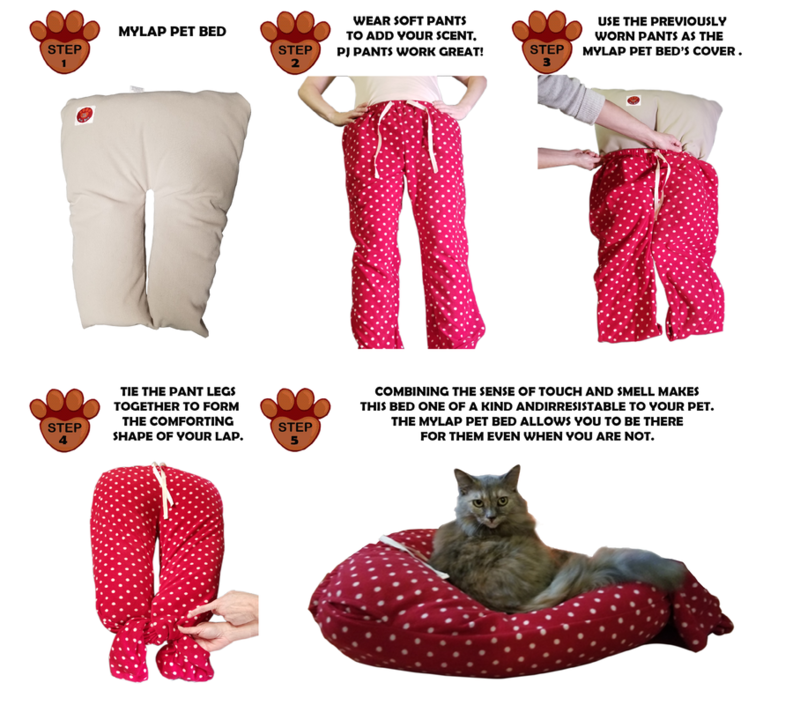 The MyLap Pet Bed can have any look you want as you can completely change the look of the pillow bed just by changing the pants you use! You could decorate the bed for the seasons, holidays, your favorite sports teams, etc., just by changing the pants! MYLAP™ Pet Bed allows you to add your scent to the bed while providing your beloved pet with the comforting shape of your lap. The pillow bed is shaped just like a lap, which allows you to use any pair of soft pants, like pajama pants or sweatpants, as the bed cover. Senses of familiar touch and smell may help reduce separation anxiety and keep your pet calm. Less pet hair on your bed, couch, and chairs. You can decorate the bed for the seasons, holidays, ect., just by changing the pants! ​A perchance of every order placed is donated to a non-profit animal wellness cause for homeless or abused pets. In 2018 we donated 29% of our gross sales! ​your lap, your smell,their bed! See What other people are saying about MYLAP Pet Bed! "Such a wonderful product. I put the bare mylap pet bed on the floor and the dogs just looked at it. I put my jammie pants on it and voila, the dogs are now competing for the bed. I think I need a second one! Excellent product. I wish I had it before my older girl passed, it would have been a soothing place for her to sleep." "I received my pet bed last week and everything from service, shipping,quality was perfect. This is an ingenious idea for those who have pets suffering from separation anxiety. Love Love Love." 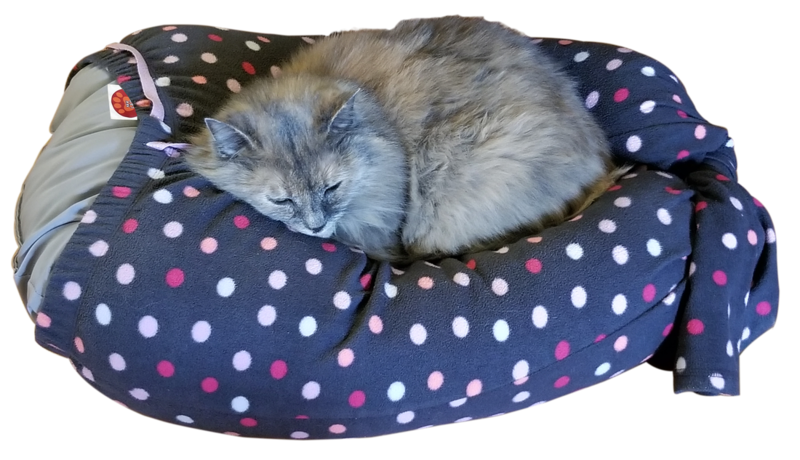 "Our little girl, Smudge, loves her MyLap Pet Bed!! She's very cozy, being surrounded by familiar scents. It's a pet bed that you cover with worn sweats or pjs. One of my cats took to it instantly! The other one is taking her time. This is a great product and I’m glad I purchased them." ​SIGN UP WITH YOUR EMAIL ADDRESS TO RECEIVE NEWS, UPDATES AND INFO ON FUTURE DEALS.